Does God require us to repent before we can be saved? Can’t we just trust in Christ? Believe it or not, the Scripture tells us that God is the One Who grants us the ability to repent. Unless God’s Spirit quickens us to new life in Christ, we remain dead in our sins (Eph 2:1-4). The Apostle Paul understood that it was Christ that came to him, calling him, not the other way around. God sent Jesus so that His chosen people would repent and be saved (Acts 5:31). The Gentiles didn’t figure out that Jesus was the Savior and then decided to repent. Scripture teaches that it was to “the Gentiles also God has granted repentance that leads to life” (Acts 11:18). He writes to Timothy that “the Lord’s servant must not be quarrelsome but kind to everyone, able to teach, patiently enduring evil, correcting his opponents with gentleness. God may perhaps grant them repentance leading to a knowledge of the truth” (2 Tim 2:24-25), and if God grants them repentance, “they may come to their senses and escape from the snare of the devil, after being captured by him to do his will” (2 Tim 2:26). Otherwise they, like us, would have been dead in our sins and unable to repent. We’d have as much of a chance as Lazarus resurrecting himself. He needed Jesus! So do we! God grants us repentance. That repentance shows up in a changed life, and we only then are we able to escape from the devil’s snare that formerly held us captive. Unless God had granted us repentance, we would still be in Satan’s grip. Sometimes people confuse worldly sorrow with godly sorrow. They may think they have godly sorrow, but if they have not repented of that which is causing them the sorrow, then it’s not godly sorrow, or God-granted repentance. The 5 year-old-child is sorry for getting caught with his hand in the cookie jar, but if he does it again, he hasn’t really repented of it. The husband feels ashamed that his wife caught him cheating on her. That’s worldly sorrow and not repentance. If it were godly repentance, the man would repent of that act, stop cheating on his wife, and he would confess it. Being sorry for our sins is not repentance. That is regret or remorse. True repentance produces a godly and obedient life. This doesn’t mean they’ll be sinless, but they will live a life where one sins less over time. Isn’t repentance a form of works? Well, can we say that baptism is a works too, since we are only saved by grace alone, a free gift from God (Eph 2:8-9), but still told to be baptized. 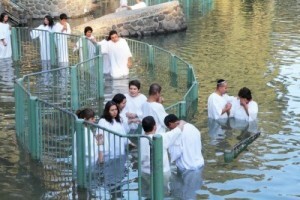 Many Christians have never been baptized and they are living in disobedience for not doing so. Baptism is still commanded, just as everyone is commanded to repent (Acts 17:30). It’s not, “I will save you freely, now just finish it by getting baptized or by repenting of your sins…otherwise you won’t be saved.” It is more like God giving us His Spirit after we trust in Christ, and then we begin desire to repent of our past sins and past life. God’s Spirit convicts us of our sins and shows us our need for the Savior. God grants all of this ability to us…including our ability to want to repent in the first place, so repentance is not works, where we are completing or adding to our salvation. Repentance is a fruit of salvation. Whoever does what is right, is righteous, so says the Apostle John in 1 John 3, and if a person does righteous things, they only do them by God’s Spirit. Repentance is not a works where we complete or finish our salvation. Repentance is when we turn to God and turn away from our former lives and all the things we used to practice (Gal 5:19-21), but unless God had granted us the ability or desire to repent, we’d still be held captive by the god of this world. We can thank God that He grants repentance because we can only trust in Christ if the Spirit of God has awakened us. For him to die for ungodly, wicked enemies of God (Rom 5:6-10), is more than I can comprehend. Why He would be so gracious to a wicked servant and grant me repentance that I might be saved, is astonishing. Repentance is necessary for salvation, but even repentance doesn’t depend on man or woman, but upon God’s Spirit. This is why He alone is worthy of all honor, praise, and glory. To Him alone we give our thanks. I want to thank you God for granting us the ability to repent, so that we might put our trust in Christ and be saved.